Tag Archives: "Bathroom medicine cabinets"
If only we were all as resourceful as Anna at Door Sixteen, who recently finished renovating her bathroom in Newburgh, New York. 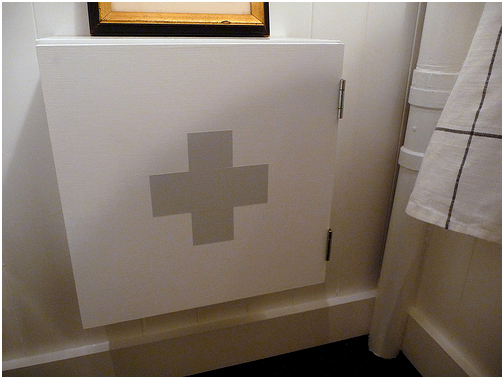 For directions and ideas on how to make a DIY Cross Medicine Cabinet, using an Ikea solid wood Forhoja Wall Cabinet and a can of paint, go to DoorSixteen.com. If you think that your bathroom could use some sprucing up, there is no need to start looking for a contractor in the phone book. From changing a shower head to replacing bathroom medicine cabinets, there are many simple things that you can do to make your bathroom a more attractive and enjoyable space.